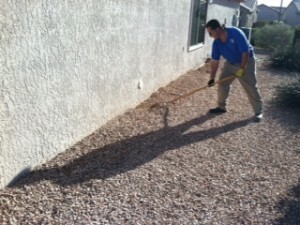 There are many types of Termites in Arizona. Depending on location and elevation termites may infest dry wood &trees, root systems, damp soil, in clay soil or soft soil and of course our wood sheds, barns and homes. Regardless of wood or block construction. The Subterranean Termite. 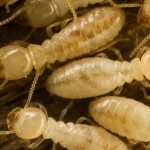 These termites live in the ground up to 25′ in depth, with possibly multiple colonies in an acre! Traveling up when conditions are proper and maneuvering over non-wood material through cracks and crevices 1/32 of an inch, that’s a piece of paper! They are social insects who have a King and Queen, they are blind and sensitive to dry/hot conditions working together to create mud tubes for protection and travel. A “mud tube” is elongated and narrow, found inside a home or structure & outside a home or structure. 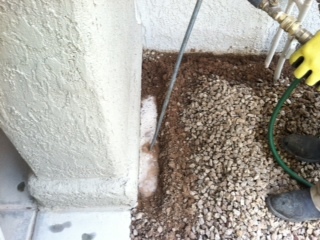 Although termites are viewed only when exposed from the tube their objective is to return to their soil depth every day. Tride and True offers quality termite inspections free of cost to homeowners and property managers to identify termite species and provide affordable, thourough, practical treatments to meet your properties needs. Visual observation of the walls and ceiling to discover mud tubes protruding out & holes. Termites eat the soft paper inside of sheetrock creating a hole about the size of a nail or tack and push mud from the hole (the beginning of a tube!). Visually inspecting, probing or sounding the accessible baseboards, doorframes, window frames. Visually inspecting, probing or sounding any furniture, cabinet or picture that is nearby a termite infestation. If the material contains cellulose (wood) it is on their menu. Visual inspection to the perimeter of the structure down low. Inspection to eaves and patio overhangs. 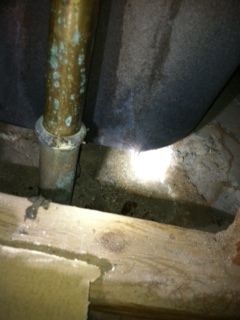 Inspection to wood posts, pillars and wood materials affixed to the home making contact with soil/dirt. A Tride and True Pest Professional will be able to pinpoint entry points and advise treatments to eliminate what is seen and help protect from what may be unseen. Stucco or wood siding buried past the grade of the landscape. Brick or stone facia additions that obstruct the foundation. Landscape modifications such as fountains, raised concrete patios, plantings within 1 foot from the base of the structure. Created storage sheds built next to the structure. Treatments involve establishing a liquid barrier to the ground by method of drilling holes, injection to cracks, trenching and probing soil up to 1 foot in depth, application of foam or a cellulose based dust to the termites in the structure directly! Tride and True uses Termidor Termiticide, Americas #1 termite defense product. Termidor is a Non-repellent meaning termites will never know it is there. Once exposed the carrier termites transfer the product to each other by making contact with one another inside the colony. This is called “The Transfer Effect”. With an expectancy of 5 to 10 years, this is a fantastic way to achieve piece of mind. It’s your home..why risk it? Contact Tride and True today for more information and to schedule an inspection.